Rising rates and a flattening yield curve are giving credit unions more bang for their buck in short-term investments. New regulation may force more credit unions to go short in the coming years. Investments as a percentage of total assets have fallen nearly 10 percentage points in the past 10 years. Net loans have increased by more than 10 percentage points in that same period. 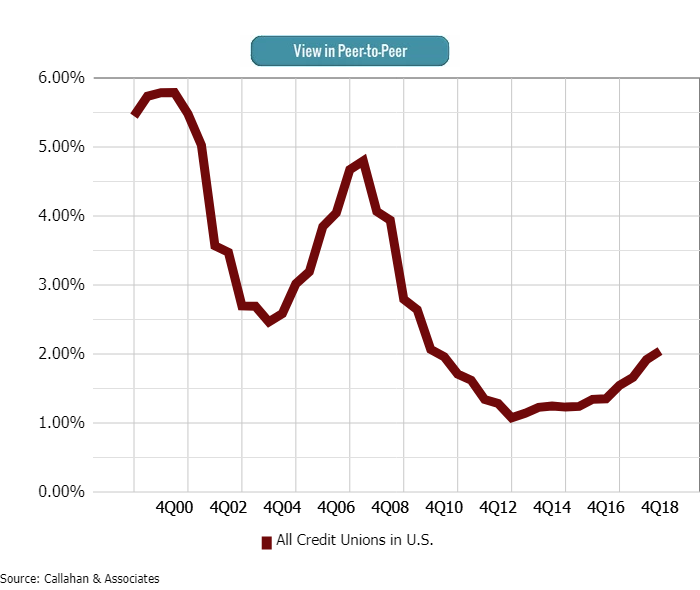 Investment growth at U.S. credit unions peaked at the tail-end of the Great Recession. Today, the total investment portfolio is smaller than it has been since fourth quarter 2011. But even as credit unions moved away from the markets, the investment philosophy of this conservative bunch held steady. For more than 20 years, the industry’s portfolio has remained heavily concentrated in short-term investment products, according to data from Callahan & Associates. In the fourth quarter of 2018, credit unions held some 72% of their investments as cash and equivalents or in investments with maturities of three years or less. Five years ago, that was 66%. Two decades of data shows credit unions prefer shorter-term investment products. That investments at credit unions continued to skew short is notable because the Federal Reserve moved the fed funds rate to effectively zero in December 2008 and kept rates there for the next seven years. During this period, the yield curve was steep, meaning the difference between short-term and long-term yields was more pronounced. Short-term investment products during this period returned lower yields; consequently, investment yields for the credit union industry likewise declined. Investment yields have started to increase as the yield curve flattens. But rates won’t stay down forever. In 2018, the Federal Reserve increased its federal funds rate four times to its current range of 2.25 – 2.50%. In March, the Fed voted to hold its policy at this range, but in light of the rate changes last year — and other regulatory factors — some credit unions are re-examining their investment portfolios for the first time in years. As the federal funds rate has risen, the yield curve has flattened. First noticeable in 2017, short-term yields and long-term yields are closer than they’ve been in some time, a factor that is changing the economics of investing. “When you look at the yield curve, there’s not that much difference between the short term and the long term,” says Russ Abbott, CEO of United Methodist Financial Credit Union ($83.2M, North Canton, OH). 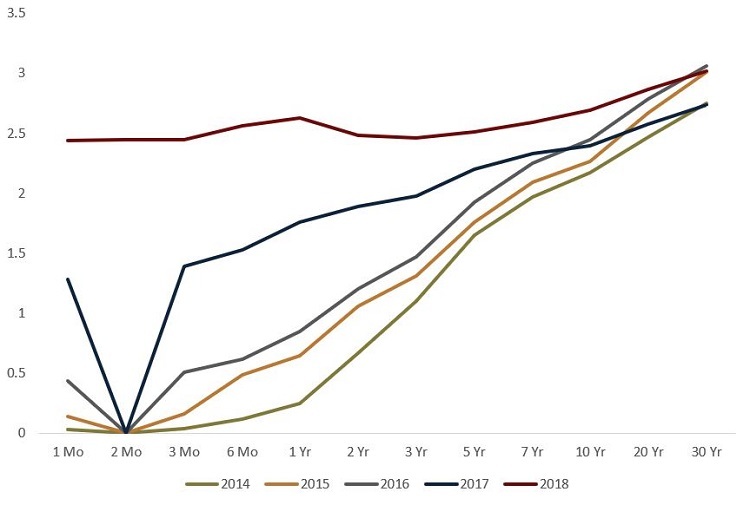 The yield curve has gradually flattened since the Fed started to raise rates in 2015. Responding to economic and regulatory changes, United Methodist Financial has worked to re-allocate the maturities in its investment portfolio. Bucking the industry trend, at its peak in 2015, the credit union held nearly 70%, or $46 million, of its investment portfolio in assets with maturities greater than five years and 5%, or $3.3 million, in those less than one year. After all, longer — i.e., riskier — investments yielded better returns. “We’re compensated based on the risk we take,” Abbott says. As of the fourth quarter of 2018, however, the credit union’s investment portfolio is more aligned with the industry. The Ohio cooperative held 2% of its investments in products with maturities greater than five years and 31% in those with maturities of less than one year. That changed occurred in response to member demand for high-yield, short-term deposit products, and reallocating its investment maturities to a larger percentage of short-term assets acts as an asset liability strategy to help the credit union better manage its margins. Regulatory factors played a role in the portfolio change, too. “We were trying to get our NEV in check,” Abbott says. Effective January 1, 2017, the NCUA adopted a standardized measurement of interest rate risk that includes updated tolerance thresholds in the Net Economic Value (NEV) Supervisory Test. NEV is a capital-at-risk measure designed to identify potential longer-term threats that could adversely impact net worth and is used widely by credit unions for risk management and ALM modeling. To Farone’s eye, the prescribed nature of the risk values assigned by the NEV Supervisory Test limits its effectiveness and exacerbates the problem it’s trying to solve. As a measure of longer-term risk, NEV is changing the way credit unions consider their investment durations. That’s certainly true at United Methodist Financial, but it’s true for other credit unions as well. At Infinity Federal Credit Union ($345.4M, Westbrook, ME), investments as a percentage of assets peaked at nearly 43% in 2011 and its capital ratio hit a high of 11.5% in 2014. It was an investment house, admits CFO Mike O’Brien. After playing it safe for more than a decade, Infinity FCU sets a new course with checking accounts, consumer loans, and chutzpah. Read more today. It also was losing members. So, the credit union started running off investments — more than 1,000 securities to date — and moved that money into lending. Today, its investments as a percentage of assets is under 22%, below the industry’s average. Nearly 72%, or $54.3 million, of the credit union’s investment portfolio is allocated to securities with maturities greater than five years. That’s down from a high of $68 million three years ago, according to Callahan data. And although the credit union is running off investments to fund loans and serve members, it’s doing so with an eye to better satisfy the NEV Supervisory Rule. “Our investments are longer-term, and you have to be careful with maturity length under the new NEV rule,” O’Brien says. United Methodist Financial and Infinity are not alone in their efforts to adjust their investment portfolios. There were 2,293 credit unions in the fourth quarter with assets greater than $50 million, the minimum size required for NEV supervision. 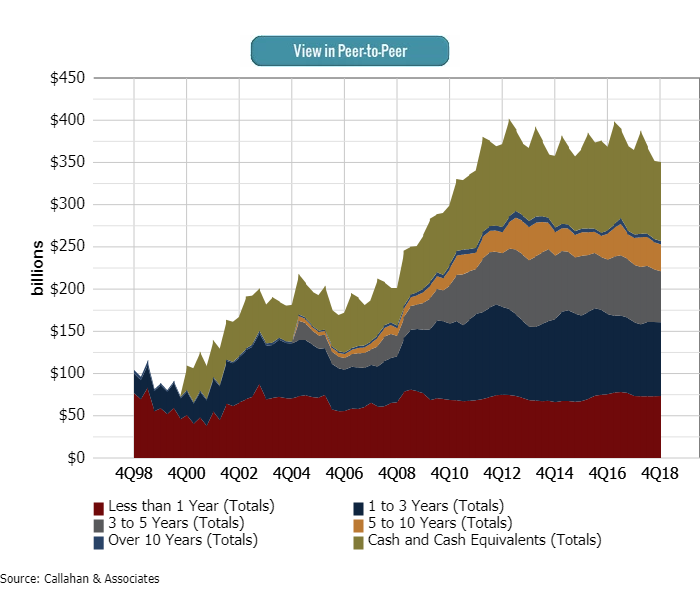 According to Callahan & Associates, the share of the investment portfolio held by products with maturities of one year or less has increased 3.9 percentage points since fourth quarter 2014 while the share of investments products with durations of five years or more has decreased 2.2 percentage points. 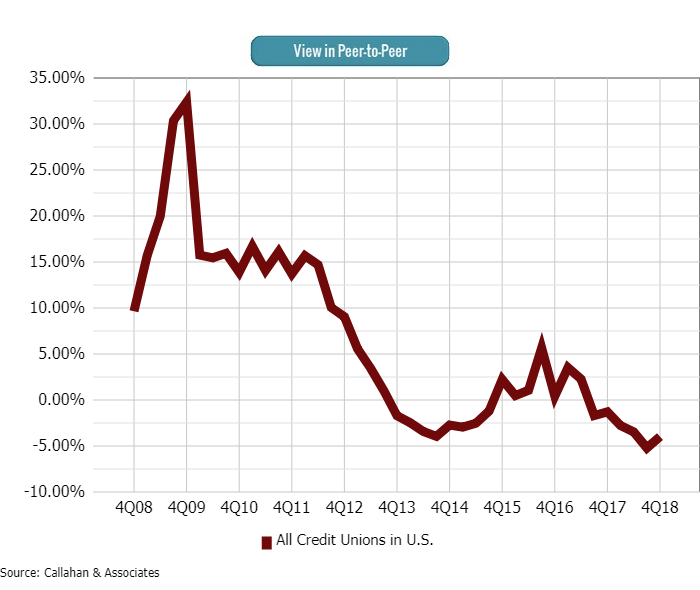 In fact, 121 of these credit unions have both increased their share of one year or less products and decreased their share of five years or greater by at least 10 percentage points over the past four years. For Infinity, where investments provide a valuable source of liquidity as the credit union works to build a balance sheet rich in lending, the new NEV Supervisory Rule would require the credit union to fundamentally alter its duration allocation that is heavily concentrated in long-term assets. Instead, the credit union will explore other balance sheet strategies to meet its long-term goals.